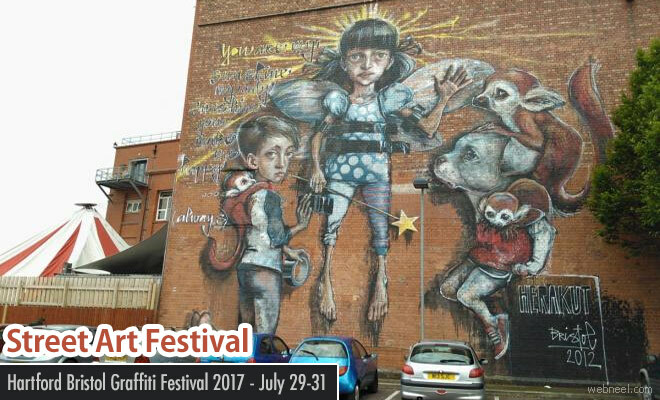 Upfest 2017 is a free Street art and Graffiti festival and it's their 24th annual edition. In 2016, out of 700 applicants, 300 artists were chosen to display their live art. Last year many artists from more than 40 countries participated in this festival. Last year artists created massive street murals on shop shutters, walls, boards, double decker bus, subway trains in more than 30 venues and locations all over Bedminster. According to Upfest website, "Talented artists travel from 30 countries and across the UK to paint live on 30,000sqft of surfaces in front of 35,000 visitors. The affordable art sale, music stages and art workshops round off a visually spectacular weekend". Tickets : Upfest is a FREE festival with all the artists painting for free and volunteers making it happen behind the scenes. No tickets are required but please do buy a programme on site and donate to NACOA.